On October 21, Anwar Hossain, a student of BA 1st year student of Satkania College and the organization’s member candidate, was attacked by Chhatra Dal's terrorists and wounded. 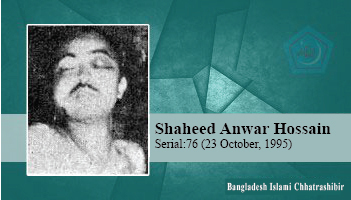 He attained martyrdom at 5.30 am on October 23. He was a resident of North Rampur of Satkania Police Station in Chittagong district. candidate Last study: Fazil, Lohagara Senior Madrasa and BA, 1st year, Satkania Government College. Fazil, Lohagara Senior Madrasa and BA, 1st year, Satkania Government College.